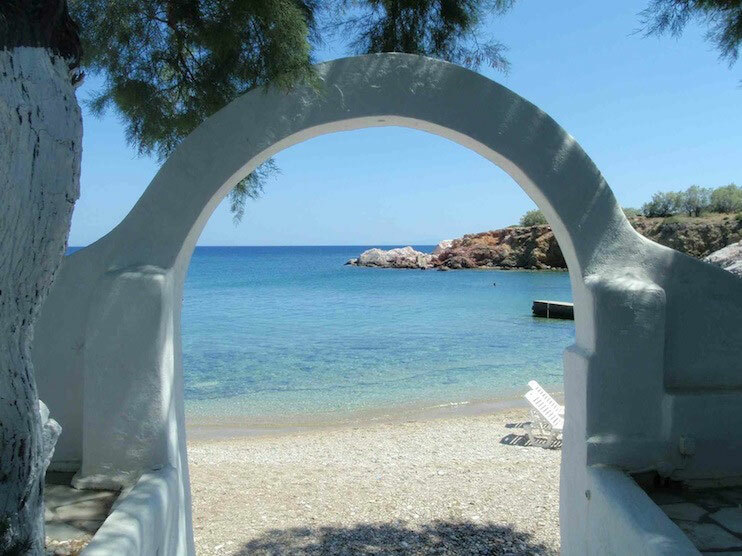 Come and join us for one week Hatha Yoga retreat on Paros. One of the most beautiful islands of Greece. This yoga holiday is ideal for solo travellers, who like to travel alone, but also like to socialize a bit with a small group of people, with common interest. You can choose if you want to socialize with (some) people of the group, or not. To eat, swim, go hiking, or go to the main village Parikia, with other people of the group, or not. It is entirely your choice if you want to be more on your own, or with others, it is all possible. Your choice. Teacher Oona Giesen started practicing Iyengar Yoga 45 years ago, around 1973. She was trained by Agnes Hillen, Margriet Post, Victor van Kooten and, most of all, her mother Jeanne Buntinx, who were all trained personally by mr B.K.S. Iyengar and were the founders of the Iyengar Yoga movement in the Netherlands. Oona grew up with yoga. She took her first yoga classes at the house of Margriet Post when she was about 8 years old. Her first yoga holiday, in 1973 in France, with Agnes Hillen-Mineur was the inspiration for what she is doing for 25 years now: organizing yoga holidays. After this week of yoga hopefully you will have a better understanding of your body, and of your body's possibility's and limitations, and the signals it gives you. The aim of yoga is not to perform the most difficult yoga poses. With that you can easily overdo it and cause injuries and hurt yourself. The aim of yoga is to learn to listen to your body and finding more space, strength and balance, by doing exercises. Being aware of your body during yoga allows you to expand your limits without hurting yourself. Coming to that edge of tension and then softening, rather than pushing, allows us to becoming more flexible. Yoga courses are given on Paros, one of the most beautiful islands of the Cyclades. The Cyclades are a group of islands in the Aegean Sea between Athens and Crete, famous for its beauty and specatculaire architecture. No building is higher than two floors and most of the houses are the typical white houses with blue doors and windows. Paros is the most central island of the Cyclades and there are several ferries (daily) to many other islands. Oona's Yoga School was chosen by 2 million members of L(uxury)T(ravel)G(uide) to offer the best yoga holiday in Europe for 2018! The LTG Europe awards identify the best holiday destinations, hotels, spas, golf clubs, travel agencies, lifestyle companies, and much more throughout the continent; with its criterion focused on innovation, design, rooms and facilities, gastronomic achievements, service excellence, use of technology, sustainable development, marketing & branding, employee satisfaction, and location.